I'm a big fan of stir-fry and especially the really-bad-for-you-Chinese-take-out versions. Well, let's just say that is all in the past because I recently found this recipe on Pinterest and I'm hooked! I was able to pull this dinner off in just over an hour start to finish and that includes the marinating time. If I'd thought ahead and started the marinade earlier in the day this could have easily been a 30 minute meal. And hey, mine looks pretty much like what you see above so I don't think you can mess this one up too bad. 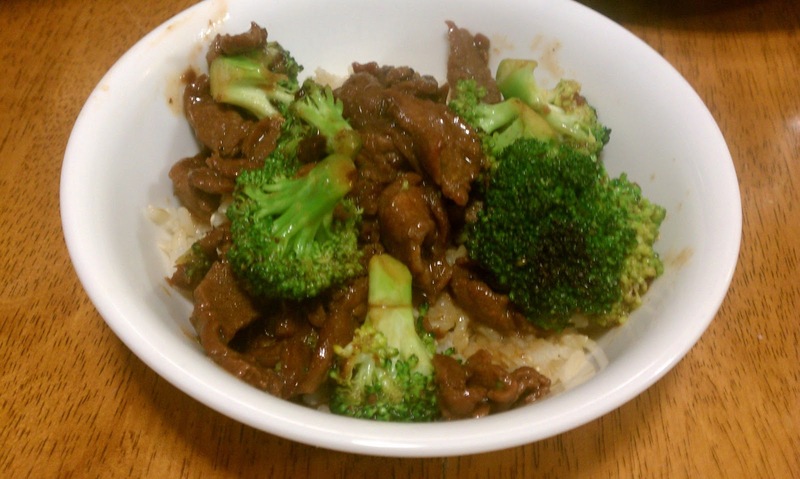 My favorite part is that the Beef & Broccoli served over brown rice has a calorie count of 368 per serving (MyFitnessPal recipe calculator) versus the take-out version from Panda Express the Panda Bowl of 500 calories without the brown rice option (Panda Express). I saved a few $$ along with those calories since this recipe easily serves 6 and only cost $2/serving instead of the $5.50 a serving from Panda. Me: "I liked it! 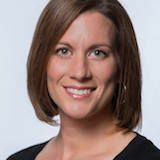 It was simple to make and if I plan ahead it wouldn't take too long after a long day at work to pull off (which is exactly what happened tonight)." Maggie (9): "It usually takes 10 minutes to chew and swallow the meat but this is easier to chew!! It is so yummy! Can I have this for my lunch tomorrow?" Emma (6): "It is delicious! I really like the broccoli." 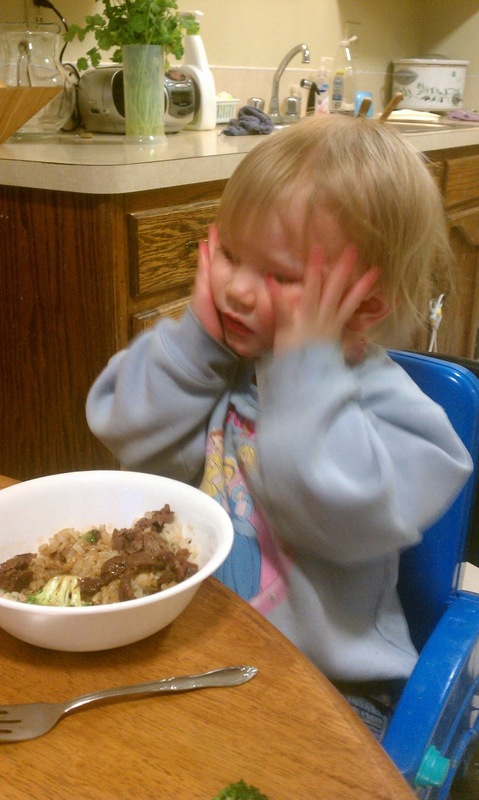 Lilly (20 m): She picked at the broccoli and meat but dug right into the rice and sauce. Then this small child proceeded to take said rice and sauce and rub it all over her face (see photo example). Apparently she prefers it as an exotic Asian exfoliation cream?